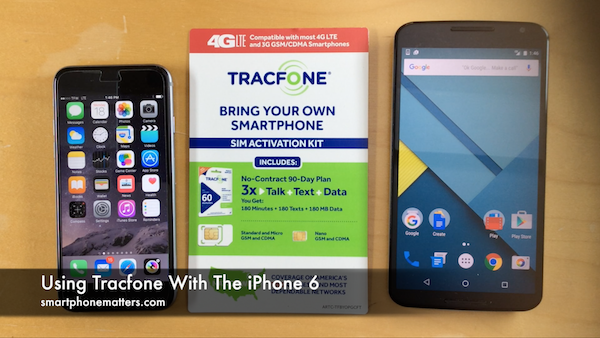 In this video I demonstrate using Tracfone Wireless with the Apple iPhone 6. In my previous videos I signed up for Tracfone using a Tracfone Bring Your Own Smartphone SIM activation kit and my BLU Life One 4G LTE Android smartphone. In those videos I took the Tracfone ATT GSM LTE nano SIM and activated it using a No Contract 90 Day Plan. Now I have moved that SIM from my BLU Life One smartphone into my iPhone and I wanted to show you that all the Tracfone features do work with the iPhone 6. In the video, I demonstrate calling, sending and receiving text messages, sending and receiving MMS picture messages, and using cellular data to connect to the Internet and visit the tracfone.com website. I also show that I am able to check my Tracfone account balance by dialing *777*1# on my iPhone’s dialer. You can see that I have 169 minutes, 155 texts, and 50MB of data left. Finally, I wanted to mention that all these features worked without any additional setup after inserting my Tracfone SIM into my iPhone. I did not need to set up you Cellular Data and MMS APN in the Settings. If fact if you go into Settings > Cellular you’ll see that the Cellular Data Network option needed to set the APN information is not visible.